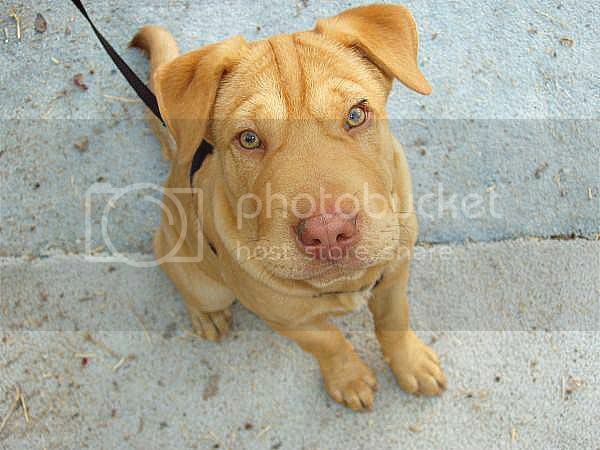 Shar pei / Labrador mix questions? Awww, he's adorable!!!!! Looks purebred to me. . .I hope you get to keep him, and if not I hope he goes to a wonderful loving home. What does Satchel mean? If I gotta keep & name him, I'd like to name him something that relates/indicates somehow to that fact that he's found me by pure chance, not that I was intendedly looking for him in the first place. I'm thinking about "Chance" - but right now we call him "chubby boy"
I did find a list of neat chineese names once or you could go with some kind of old proverb writer or something. I think chubby boy is perfect though! I have to say I'm kind of bothered that no one is considering the possibility that this dog may be someone's lost pet. Some poor family could be missing their dog horribly. He's beautiful, he's well fed, and in all likleyhood he's somebody's baby. I will not post again on this thread, but for this last plea: PLEASE at least get him scanned for a microchipped, and check with the local shelter to see if someone is looking for him. Put yourself in these shoes: both of your dogs run loose- only one comes back. Wouldn't you be devestated? Wouldn't you want someone to bring your dog back to you? I mean, if he doesn't have a family who is really missing him, then sure, keep him. But at least give it a chance to bring him to his rightful people if they still want him. I agree with Kees. =( Many Chazzers, even, have lost their dogs... even you yourself could've lost Mocha that one day. It's wonderful of you to give him a safe place to stay & food, but give it a few weeks before deciding whether or not you want to keep him forever! I recommend posting everywhere - the city/local newspaper, Craigslist, posters at animal shelters, etc. He does look very healthy and he sounds like a sweet little boy! Of course if I loose my precious, I'd be devastated, and would give the world to have them back. I do feel bad for someone who may have lost him, but it has been a week, with his poster posted everywhere, & everyday ads on the newspaper, still no one has come forward to claim him. I also planned to take him to the vet this Saturday to have him scanned. I did call the two closest shelters to no avail. It's not like I'm stealing him away from his rightful owner or keeping him on purpose. Geesh! I took him to the vet on Saturday to get him scanned for microchip, but he has none. I called the local shelters to see if someone had called for him, there was none. I then asked my friends & relatives to see if anyone would like to have him. Everyone who met him loved him from the first sight, but not everyone could afford to have a big dog (including us).. Finally, we gave him to my bro-in-law's bestfriend who promised to take good care of him. At least I'll get a chance to see him in the future. Wow he sure is one good looking dog!!!! I'm glad you helped him out . OMG, look at that face!!!!!!! He is sooooo cute!!!! Here is pics of my two lab crossed shar pei's. The are sisters. Jessie and Millie. Jessie who is my baby have more lab in her and Millie have more shar pei in her. They are 8 weeks old. How do I post pictures please. Hi there, I know this is a very old post. But I stumbled upon this when looking at photos of what I thought might be the cross which my dog is. And I am totally blown away, this puppy looks identical to my dog that I rescued from the streets of Mexico!! Like identical!!! I wondered does your brothers friend still have him? If so I'd love to see pics of what he looks like now!!! So very interesting! !